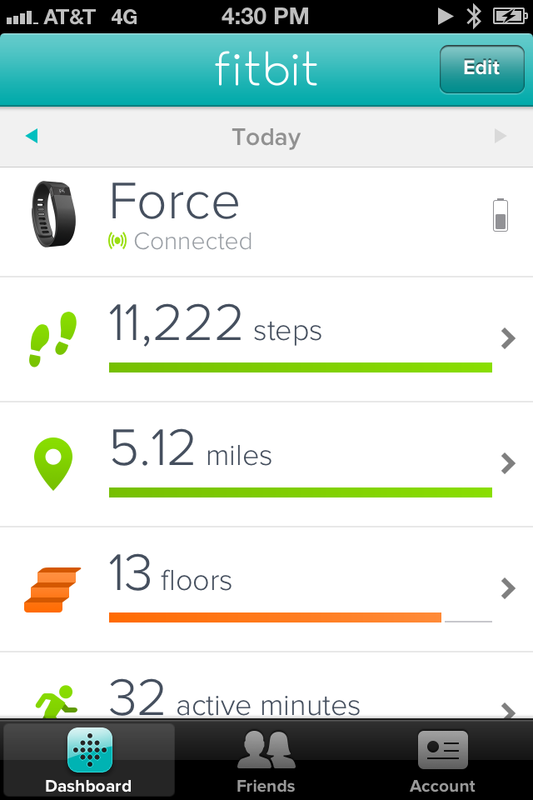 The Fitbit Force is basically an advanced pedometer that you wear like a bracelet on your wrist. It tracks steps, flights climbed, active minutes, total miles traveled, calories (burned, eaten, and left to eat for the day), pounds to lose, sleep patterns, and water consumed. With the Force you can press a button on the side of the display to see your progress, or use their iPhone app or online dashboard. -Really easy to set up and check stats on. I downloaded the Fitbit app for my phone so I rarely use the computer syncing chip, but the online dashboard is just as good if not better. -Comfortable. The Fitbit is just a thick bracelet, which isn’t even noticeable if you are wearing long sleeves. Water resistant, choose blue or black in color, wear on your non-dominant hand. -Super long battery life. Needs to be charged less than once a week. -Cost. As I mentioned, I was lucky enough to be gifted the Force, but at $129 it’s not particularly cheap. However, I would say there are much pricier investments you can make in your health, and this one is definitely worth it. If you wear it every day for two months, that’s just $2 a day. -It makes you hyper aware of how active – or inactive – you are, and it encourages you to be more active. More on this below. -Does not recognize all activities as “steps” or “active minutes.” For example, I take a strenuous heated yoga class that shows up as nothing on my Fitbit, yet I know I am being active. Walking in place also seems to be hit or miss – it catches maybe 80% of your effort. But, you can add an activity and it will estimate your calorie burn. -The food finder used to estimate your calories burned is not as intuitive as that on the Lose It! App. (Or, I’ve just been using Lose It! for so long that it’s too hard for me to switch over.) However, a pro is that you can link Lose It! (and several other apps) to your fitbit easily, and all of their information just syncs together. -The sleep function isn’t particularly useful, to me at least. I guess this isn’t really a con, just an observation. I’m pretty aware of when I’ve had a bad night’s sleep, so having it tell me that I was restless 18 times isn’t really information that I need or want. The Fitbit has definitely opened my eyes to my basic, non-gym activity level. The default goal settings are 10 thousand steps, 15 flights, and 30 active minutes- and I really thought that since my job is fairly active, I would blow those away before even working out. Nope. Most days, it is a real challenge to hit 10K steps, and I really have to hit the gym to get there and above. In my normal, non gym activity – full day at work, doing a few errands, walking to my car – I typically top out at 6.5K, on a good day. I’ve also found, unfortunately, that on the off day that I do hit my goals before I head to the gym, I’m kind of like, nah I’m all set, I hit my goals. This is either an unexpected deterrent, or a function of laziness brought on by extreme cold this winter. The bottom line is that, overall, the Fitbit Force is a great tool to get a real sense of your basic activity level, and to encourage you to move more in every day life, in addition to whatever workout regimen you already have.